This was year one in my five-year plan for creating a new front garden. The addition I had built onto the front of my house this past year provided the impetus to get started on this long-time dream. Because the job is big and a bit overwhelming, I hired a landscape architect to help me with some of the big-picture design elements, and I divided the project into smaller, manageable chunks. 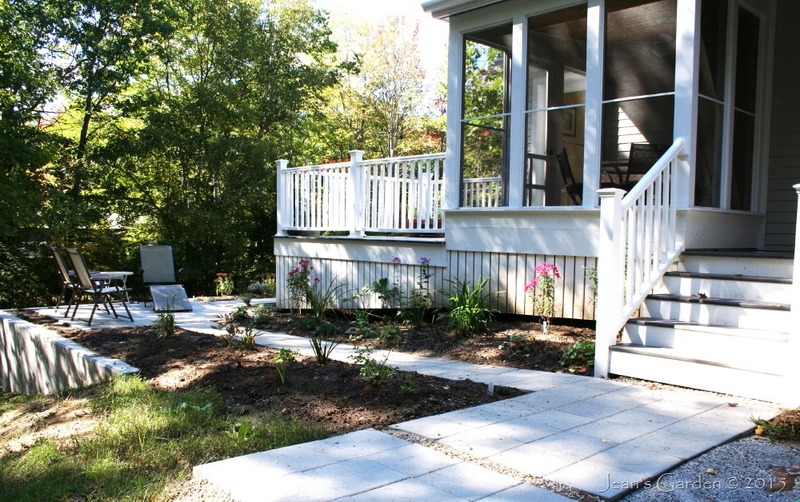 This year’s mission was to get the hardscape in place for a small patio and four connecting walkways and to dig and plant four flower beds around the patio and walkways. On September 29, I finished digging the last of these flower beds, the Patio Border; and on October 1, I added plants and declared this year’s mission accomplished! I have been designing the plantings as I go. The Patio Border is one of three flower beds that surround the front entrance to my house and that I think of collectively as the “Entry Garden.” This garden area sets the mood for the approach to my house. I wanted it to have large enough plants to create some sense of privacy and enclosure, and I wanted it to feel welcoming. But because this is the more formal front entrance to my house, I also wanted the planting to be restrained. To get that sense of restraint, I have been focusing on repetition of just a few plant types in each flower bed and restricting the color palette to shades of pink, lavender and blue. Variation is created by foliage shapes and textures and by designing for a succession of blooms. You can see these principles at work in the plan for the Patio Border (above). There are only 5 different genera of plants represented in this 18’ x 4’ planting; and, except for the shrub Spirea japonica ‘Magic Carpet,’ all are repeated at least twice. The spirea, which is a division taken from the back garden, will mature quickly into a 4’ diameter clump that will fill the corner where the wide walkway to the front door intersects with the narrower walkway to the patio. 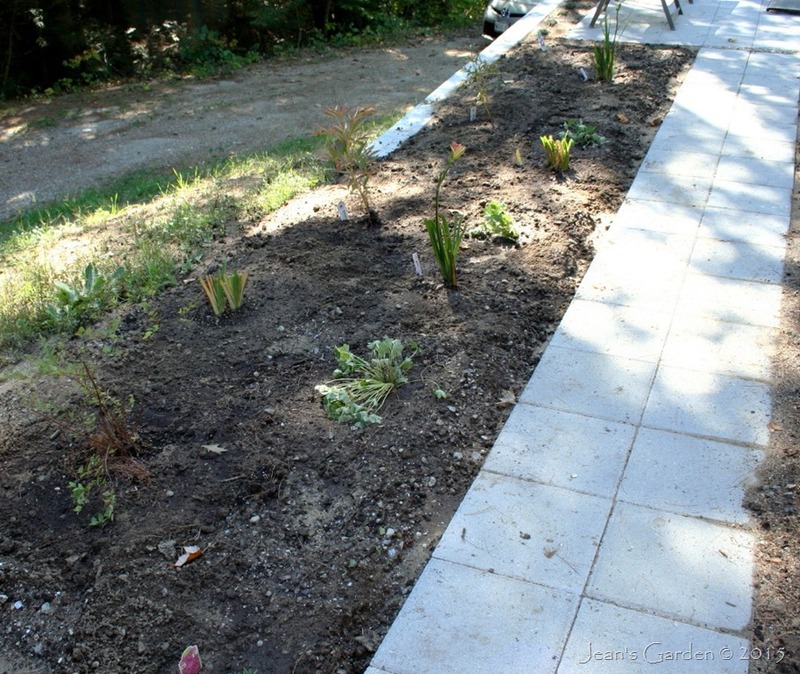 The back of the planting, which extends along the top of the retaining wall to the patio, is anchored by three peonies. ‘Monsieur Jules Elie,’ will grow to about 3’ tall and is in the center. It is flanked by two plants of the slightly shorter variety, ‘Bowl of Beauty.’ Fairly tall daylilies (Hemerocallis) will grow between the peonies. I struggled a bit with what to plant at the front of the border. I thought about bordering the entire walkway with a groundcover dianthus; but when I saw the dense mats of this growing at the Coastal Maine Botanical Gardens, I knew this was not the look I was going for. I have divided a gift Dianthus x ‘Shooting Star’ and planted it at each end of the planting. I’m considering it on probation; we’ll see how it works out. The rest of the front of the planting combines varieties of Hemerocallis that are all less than 2’ tall with clumps of Geranium x cantabrigiense ‘Biokovo.’ Given its exuberant growth patterns, I’m not sure ‘Biokovo’ is the right plant for this area; I don’t want it to grow out over the walkway, which is only 2’ wide. ‘Biokovo’ has the virtues, however, of being low growing, with foliage that is attractive all season long and that echoes the shape and texture of the Geranium x oxonianum and Heuchera foliage growing across the walkway at the front of the Porch Border. This “Perennial Plant of the Year” for 2015 is also easy for me to acquire, since it always needs thinning out and I seem to have an infinite supply. Like the Dianthus, it is on probation here. The Dianthus ‘Shooting Star’ and Geranium ‘Biokovo’ plants at the front of the border should begin blooming around the end of May, along with the Heuchera and Geranium plants across the walkway. Spirea ‘Magic Carpet’ will join in 2-3 weeks later and will continue blooming until fall. (I still have a few scattered flowers on the one in the back garden.) In late June, the peonies will bloom, and the daylilies will dominate in July. 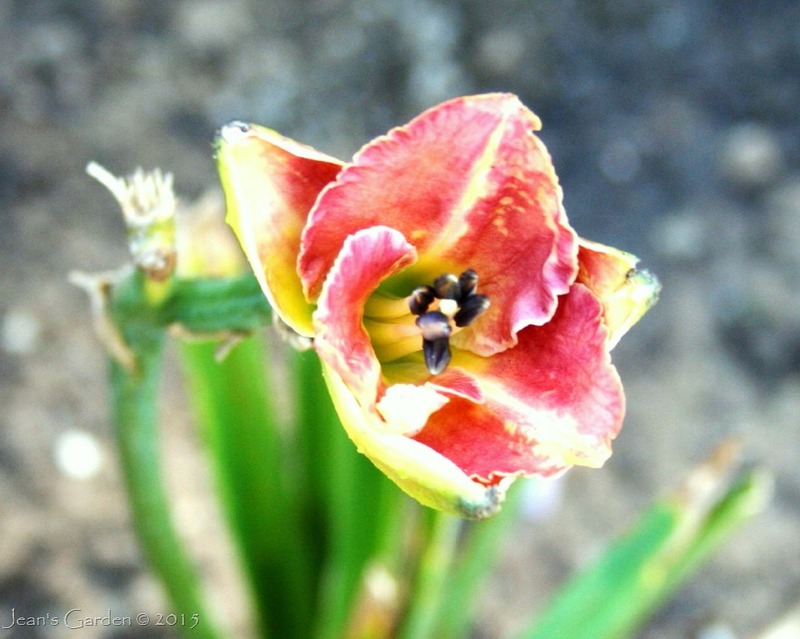 I have included early, mid-season and late-blooming daylilies here, along with several rebloomers, so I should continue to have daylily blooms in August and September. Even on a chilly morning in October, ‘Rosy Returns,’ which came from the nursery with buds still on it, was opening a flower. I’m delighted to have arrived at the beginning of October and the end of the gardening season with this front garden project on schedule. Next year, I will focus on two much larger areas, the big slope that runs from the patio border down to the driveway, and the 20’ x 10’ fragrant garden which will be created at the front of the house, under my bedroom window. These garden areas will include a much greater variety of plants, and I will use the winter to think carefully about how to use plants to give the plantings structure, coherence, and focal points. I am looking forward to those design challenges for next year and to the pleasure of watching the entry garden plantings begin to mature. Congratulations! Not knowing much about gardening myself — I’m still learning how to grow a couple of herbs in ceramic pots on my apartment’s front stoop — I am still happy for you! I especially love how you will be pondering the garden during the wintertime. Delightful! Kim, This is a fun way to keep me connected with the garden during our long winter. I’ve already taken measurements of my two planting areas for next year, so I can plot them out on graph paper and start playing around with planting ideas. You are much more thorough in your garden plans than I am. My garden and I walk along together, surprising each other. Still enjoying an exuberant welcome of Flanders red poppies next to our front door . LOL, Diana, spontaneity is not my strong suit! Your poppies sound wonderful; I’ve never had good luck growing poppies here. I really appreciate the detail you are sharing; I’m learning a lot and getting a lot of ideas I can use in my own garden and landscape. I’m pleased to hear that, Charlie. Sometimes I can only figure out the logic of what I’m trying to do by writing about it. Gerrie, This comment sent me to look up Canberra’s climate. I would have guessed that it was too hot there to keep peonies happy, even if you had water — but your climate is milder in summer (and also in winter) than mine is. I am fortunate in living in an area of abundant water. (My town has a big bottled water company, so we are water exporters.) Although I don’t have an all-natives garden, I try to include some native plants in every part of the garden. Jean, you have accomplished so much, and your new home addition looks fabulous with the new walkways, patio and garden areas. Your winter’s work with all the planning to do will no doubt be quite satisfying. A fragrant garden under your bedroom window sounds like something out of a romance novel! Deb, LOL, I don’t think of myself as a romantic; but you’re right — my dream of having gorgeous fragrances wafting through open windows into the bedroom on summer nights is a very romantic fantasy. Congratulations upon completing your first mission, Jean! I think your decision to limit the number of different plants you introduced in the front garden is a good one. I suffer from a collector syndrome and usually pile in too many different plants, which I’ve learned can create a mish-mash effect. Your restrained approach will have more impact, which is what you want when you walk up your front entryway. I look forward to seeing the new borders in bloom. I’m quite envious of the peonies! Kris, I’m very pleased with what I’ve gotten accomplished this summer. My first plantings were one-of-this, one-of-that hodge-podges. Since many of the plants I collected didn’t survive and I kept dividing the ones that did well, eventually the garden started to develop more repetition and coherence. Now I satisfy my inner plant-collector by choosing to group similar cultivars of the same species (e.g., Mons. Jules Elie and Bowl of Beauty are similar looking peonies; and, although there will be 6 different varieties of daylilies in this planting, they will all be in shades of pink). Jean – What a great post. I am so admiring of your planning, patience and restraint. We bought a new house this spring and although there has been some thoughtful planning, with the help of Julie Moir Messervy’s Home Outside Palette, custom design, we have just been plunging in with our cardboard and 7 cubic yards of compost. The soil in this new garden is terrible. You can see what we are leaving and what we have created in the back garden so far http://tinyurl.com/oll7b3q and http://tinyurl.com/nbx3cq6 will show you the other sections of the garden. Time has passed and things look a bit fuller and so far it doesn’t look like any fatalities. We’ll see what winter brings. You remain an inspiration and I am so glad for your reports. Pat, I love seeing what you are doing in Greenfield. Thanks for pointing me in the direction of Julie Moir Messervy’s website. I would have loved to try out the do-it-yourself Palette app, but it only seems to be available for smart phones or tablets, neither of which I have. Her book The Inward Garden really helped me to clarify my thinking about my new front garden. I’m going to look for the Home Outside book to see if it can offer additional help. Now that I’m through creating new flower beds for this year, I’m hoping to get caught up with some of my favorite blogs, including yours. Jean, Congratulations! What a transformation. I can’t wait to see the photos next summer when the garden is in full bloom. I also envy your ability to plan and choose plantings judiciously. My gardens are more of the willy-nilly variety. You are an inspiration! Enjoy your beautiful new spot. Jean, It is so satisfying creating a new area in the garden, congratulations on completing stage one. I bet it will end up looking terrific, I am finding a new interest in Heuchera which did not thrive in our previous garden, but has taken off here in our new place. Alistair, I discovered Heuchera the same year I discovered the world of small independent specialty nurseries. They’re wonderful foliage plants, and they also have a long blooming season here. I tend to have old-fashioned taste in plants, liking simple traditional forms and colors rather than the latest razzle-dazzle. Thus, I’m not a big fan of the latest colors in Heuchera foliage; the ones I’ve planted in the new front garden are ‘Raspberry Regal’ — plain green leaves and lovely spikes of red-tending-toward-pink flowers. Can’t wait to see your news beds in bloom next year! Great selection. Jason, I’m eagerly anticipating how these flower beds will fill in next year. Love the thoughtful plant choices and the inspiration to go slow and break it up into manageable pieces. Hi Jean, you’re such a contrast with my approach to gardening. While you meticulously plan, consider and exercise restraint – all the qualities I admire – when it comes to me, I plant almost randomly, or consider things at the last minute, have impulse-buys that need slotting in and I can’t think of a single example where I may have exercised restraint. I’m looking forward to how this border develops and your thoughts on the larger borders at the front.